Many industrial manufacturing processes revolve around the molecule 3-hydroxypropionic acid (3-HP). This organic molecule can be used in a variety of industrial products, from biofuels to plastic production. As a biologically produced chemical, 3-HP is biodegradable and thus a better substitute for inorganic plastics for environmental reasons. As 3-HP-derived plastics degrade, they release carbon dioxide, but do not persist for thousands of years in landfills (as PET plastics do). While much of the field is focusing on maximizing the production of this important molecule, a much smaller subset is focused on finding ways to sense and measure its production in an effort to aid industrial manufacturing systems. 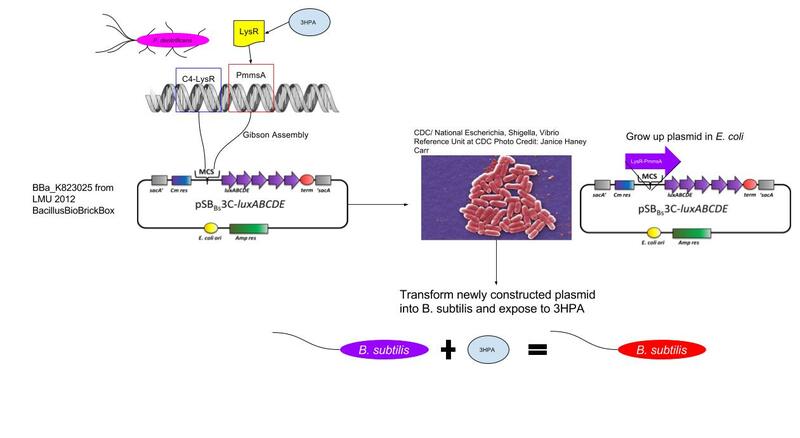 In a recent study, genes from the bacteria Pseudomonas putida were incorporated into Escherichia coli and Cupriavidus necator and demonstrated that repurposed regulatory proteins from P. putida could be used as a biosensor for 3-HPA (Hanko et al. 2017). A separate study identified similar 3-HP responsive genes in Pseudomonas denitrificans (Zhou et al. 2015). Our summer iGEM research project seeks to use the same 3-HP responsive genes found in P. putida and P. denitrificans as switches for a reporter. This reporter will ‘program’ our bacteria to express a unique color in response to the presence of 3-HP. Additionally, we are seeking to add this system to Bacillus subtilis, a hardy bacterium that has great potential as a 3-HP producer for industrial processes and metabolic engineering experiments. B. subtilis can withstand high concentrations of 3-HP without triggering ‘toxicity’ pathways. By modifying naturally occurring proteins with 3-HP sensitive genes in new organisms, we can tune our biosensor to be used for different purposes in research and industry. This collection of 3-HP responsive biological tools can also be used by future iGEM teams around the world, as we will package our system in biological packets known as Biobricks. Similar to Lego pieces snapping together, Biobricks can be easily incorporated into bacteria by other iGEM teams to build larger projects with an amalgam of these biological building blocks.